“Heidi Chronicles” Closing Sunday is a Crime! “The Heidi Chronicles” closing on Broadway on Sunday is a crime! I just saw it for the SECOND time last night, and enjoyed it all over again. I RARELY, as you know, dear readers, RETURN to revisit a show, especially in this high Drama Desk season, but I’m so glad I did. The cast was very relaxed and giving and warm, warm, warm and funny, too, as the late Pulitzer winning playwright Wendy Wasserstein was in real life. Insightful, witty, observant, and yes, timely, too, I do feel that Wasserstein’s “Heidi” is not dated at all and is as relevant today as it was then when it opened to great critical acclaim in 1989. It won the Pulitzer and also the Tony. And I saw the original production, but I liked this one much better. 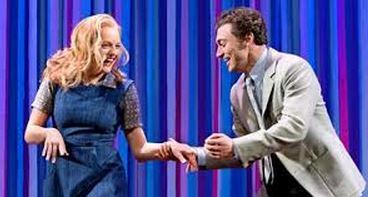 The performances of Elizabeth Moss in the title role and the redoubtable Bryce Pinkham as her gay best friend were both awards-worthy, and thankfully Moss has been nominated for a Tony for Best Actress. Pinkham however was not, although he did get an Outer Critics nomination for Best Featured Actor in a Play. The Drama Desk ignored it completely. I wonder if the shows’ unexpected, premature closing had something to do with the unjust lack of awards consideration “Heidi” has gotten. Elizabeth Moss was simply magnificent last night, shining like a golden sun and immensely relatable as the hapless heroine Heidi. Moss’ monologue ending with the famous line “I feel stranded” was a bravura tour-de-force of the highest order. And Pinkham held his own in a 360 degree turn from his usual villainous musical rogues (“A Gentleman’s Guide to Love and Murder” and “Ghost”.) as a very warm, relatable doctor. His Dr. Peter Patrone goes from campy to bitchy to saintly in an arc than every gay man was experienced since the ’60s, ending with yes, a penultimate scene dealing with AIDS in the late ’80s. The hyper-versatile Pinkham captures every nuance, pulse and throb of pain and joy that Peter undergoes. The house was packed last night. The audience applauded every scene. That’s something that rarely happens with a straight play. I urge you to try to see “Heidi” before it closes on Sunday. Maybe there will be enough of a demand to see its’ beautiful life extended. The problem with this tremendously readable, lavishly illustrated book, is that it really is too much of a muchness. There are too many biographies attempted in too small a space. a mere 456 pages. But it is a great attempt. And a great story. And in the end a great book. One to treasure and to re-read. Once, in this case, is not enough. There’s just soooo much to it! It’s a biography like no other, tracing the seemingly evanescent, but actually earth-shaking impact of one highly developed culture on another completely under-developed one. And for certainly most Americans at the time, Paris and indeed France itself was the most enlightened,most enriching place to be. America, still young, did not have the tradition in the arts or in medicine that Paris did and McCullough floats the interesting hypothesis that withOUT these virtually uncountable Parisian trips, by impressionable, but talented young Americans, this country would not have prospered and flourished as it did, during this time and in the century that followed. And Paris seemed affordable then, believe it or not. And what “The Greater Journey” affords is a marvelously concise entertaining bird’s-eye view of all these cultural astonishments. In 1900, when the book ends, the Eiffel Tower is built for the Great Paris Exposition of that year, and it’s a fitting symbol and emblem of what all the lives detailed in “The Greater Journey” have been building towards for the whole of the 19th century. The Statue of Liberty itself is being built and looming large over the Parisian rooftops as the book ends. It seems perfectly fitting that it does so, for McCullough posits, this is symbolic of how French culture has affected Americans. One forgets that it was a gift from the French. There are sooo many amazing and untold American stories that McCullough tells for the first time here, that is impossible to list them all. One sees McCullough in his exhaustive research for his greatest book “John Adams” coming across the many, many American stories of unsung heroes in war and in peace, in science and in art, and McCullough attempts to sing their praises here. I guess the strongest figure to emerge from “The Greater Journey” for me was the sculptor Augustus Saint-Gaudens, who really is the father of American classical sculpture. His massive figures of Civil War heroes Farragut and Sherman adorning parks that one passes through in NY on a daily basis. These statues are a part of all our lives here, even if we don’t really pay attention to them or notice them. They are part of New York’s cultural landscape, and after reading about Augustus Saint-Gaudens in the compelling, almost breathtakingly urgent way that McCullough writes about his building these behemoths, you’ll never pass them by again. The construction of the Farragut statue, which resides to this day in Madison Square Park between W.23 and W.26th St at the juncture of Fifth and Madison is given a whole chapter in this crowded book. And it is by far the best. The red-headed, obsessed son of French shoemaker and an Irish mother, I became very interested in Augustus Saint-Gaudens because of this book and actually watched an excellent PBS documentary on him, whilst I was in the midst of reading it. It enriched my understanding of Saint-Gaudens, and also the audaucity of McCullough’s “Greater Journey” achievement immensely, Both Saint-Gaudens and McCullough are attempting monuments and both succeed magnificently, one complementing the other. “The Greater Journey” makes you hungry for a more complete picture of those pivotal, historical figures that we only catch glimpses of here. Like Harriet Beecher Stowe, who fled to Paris to escape the acclaim that her incendiary book “Uncle Tom’s Cabin” caused. A case can be made that it actually caused the Civil War. No wonder she wanted to escape to Paris. Henry James, the most formidable American expatriate writer of the time the book deals with(1830-1900) is only dealt with glancingly here. I guess McCullough chose to just mention the most known and dwell on the little-known or forgotten like Saint-Gaudens or the only woman Impressionist painter Mary Cassatt. She and Saint-Gaudens really do stay in one’s mind as the book ends with them, and their passings. Ditto the painter John Singer Sargent, who is the only personage here whom McCullough HINTS might be gay. But he concludes that it is something unknowable. I wish we knew more. But there are many, many more wonderful American and French characters to be encountered in “The Greater Journey, ” an invaluable and original book for all it attempts to be and for the many Americans who emerge as brand new heroes and heroines in their chosen fields here. Read it now! And then re-read it! It’s the perfect Christmas gift for all Francophiles! Of which I admit I am one.